With the Indian government demonetizing the two currency notes of Rs 500 and Rs 1000, we offer you one dish to make your pockets a little bit lighter. Of course, for that, you would have to make a quick trip to London city. Bombay Brassiere in South Kensington, London is serving a delectable bowl of Indian curry to pamper your taste buds. Isn’t it great to hear that our Indian delicacy is on the list of most expensive food? However, hold on! This Indian curry is not some ordinary curry. Yes, this is no simple home-made Indian curry. Before you have further doubts on how a simple Indian curry could be sold at an exorbitant rate, read on to know more about this scrumptious meal! It is THE ‘SAMUNDARI KHAZANA’, which literally means Sea Treasure. A bowl of this curry is no less than a real treasure with the best of sea produce. It is priced at £2,000 per portion and makes for the world’s most expensive curry. All super expensive ingredients make up this dish. 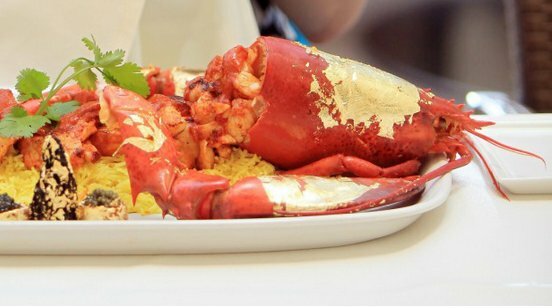 It consists of Devon crab, half tomato stuffed with beluga caviar dressed with gold leaf, Scottish lobster also coated with edible gold leaf, four abalones, four quail eggs stuffed with more caviar, and finally topped with slices of white truffle for a nutty flavor. Head Chef Prahlad Hegde launched this curry to mark the launch of the very famous Slumdog Millionaire DVD. We could travel the world and master all sorts of skills, but the true taste of ethnic food comes from our mom’s kitchen. Wouldn’t you agree? Similarly, Chef Prahlad is not too far from it. He too found the inspiration for this dish from his mom’s curry recipe. Will you devour the most expensive curry? What are your thoughts and views? Let us know in comments below!